It was 15 years ago today that Tommy Angelo stepped out of a cab and into a life of crime. The first Mafia game, taking place in the city of Lost Heaven, cast you as a new member to the Salieri crime family. Long-time fans of the franchise probably already knew that. But not many know how we got to that point. Meet Roman Hladik. 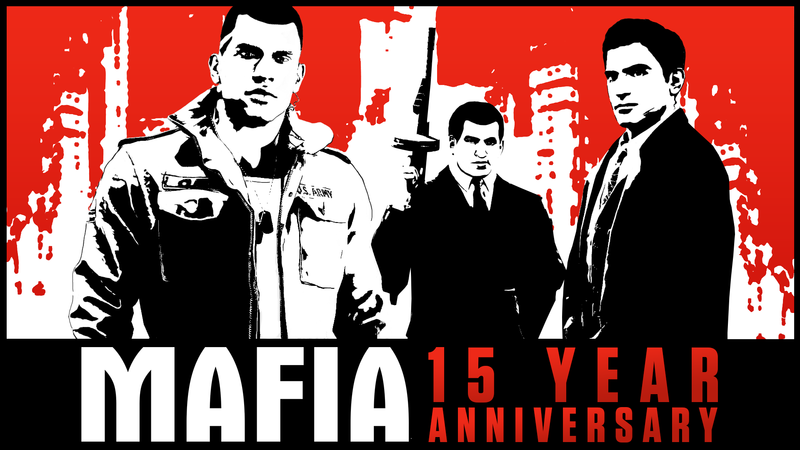 Roman’s been on the Mafia team the whole time – over 15 years working on all the games. For the first title, he was responsible for character art direction, and for Mafia II (and Mafia III) he oversaw art direction for the whole game. We asked him to remember back to those early days and talk about how the first game got made. The development team consisted of five people (including Roman) back in 1997. 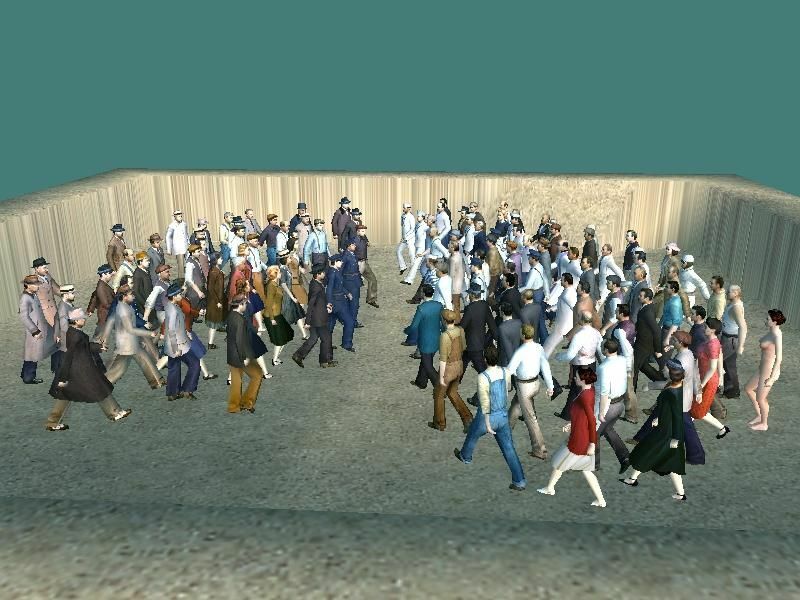 Five years later, when the first Mafia game shipped, the team had grown to nearly 40 people. “Back then, we were creating a game that we wanted to play,” He recalls. “Honestly, we didn’t know what to expect when the game shipped because we were so close to the project and worked so hard on it for so long. Obviously, we hoped people would like what we made.” And people did. With the console generation jump to the Xbox 360 and PS3 era on the horizon, the team decided to move to a new, internal engine. Once again, the development team needed to grow to meet these new challenges. 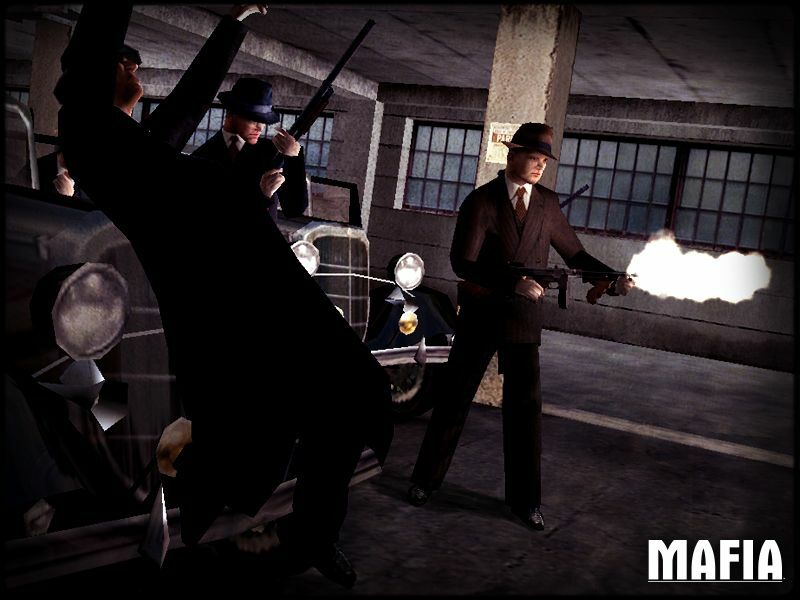 By the time Mafia II launched in 2007, there were nearly 200 people at two studios in Prague and Brno. The team’s goal was two-fold: give players an intense and authentic experience, worthy of being a sequel to the first Mafia game, but also to take it a new direction. It was with this game that the Mafia franchise broke out to whole new audiences. Fans flocked to the gritty story, the incredible setting and Vito Scaletta as the anti-hero the players controlled. A fan favorite was born. “With the third Mafia game,” Hladik continues, “We had the same conviction as at the beginning of the second Mafia game to further raise the quality bar.” And the timing once again coincided with the console cycle change, so planning began for Mafia III to release on the PS4 and Xbox One. The team had a new vision with Mafia III, according to Hladik: “To provide a raw, less romantic view of the American underworld.” You still had a criminal’s perspective of the world, but this time pitting you against the Italian mob. This new approach was the backdrop for a new tale of using the machinery of organized crime in a personal tale of revenge. “Just like the two previous installments, the third is based on a very strong story and, moreover, offers a larger, more open world than the previous titles,” He added. The Mafia series has always been about taking chances with powerful stories that reflected the times. The series took you to cities you felt like you could live inside. The characters involved in this life of crime felt real. As we got to reminiscing on the franchise, Roman pulled up some old photos. He asked to share a couple of them with you as we look back to the first Mafia game. That was my test scene in the original Mafia’s game editor where I had placed all characters to review them and keep consistency. Although they look like they walk they were not moving, I just set an animation to them so they are not in a T pose for the screenshot. I used to set up faked action on a test scene. Same concept as in the other game editor picture (above), but I tried to make a “story” by placing them in specific manner. If we’re being honest, it was just for fun. That picture was by our first offices in Brno. People in the picture from left: Roman Hladik (tall guy), Daniel Vavra, David Semik, Jan Straka, Pavel Cizek, Dan Dolezel, Radek Marek, Pavel Prochazka, Tomas Hrebicek (baseball cap), Michal Beran, Vaclav Kral. Milas Saffek and Pavel Tretera, and some other team members, are missing in the picture. That is me in 2002, working on facial animations. And, yes, we used a joystick. It was our internal tech and we decided to use analog joysticks to control morphs for facial expressions. The joystick worked well because it has three axis for mixing basic poses plus an analog throttle we mapped for expressions – it went from happy to extreme anger. 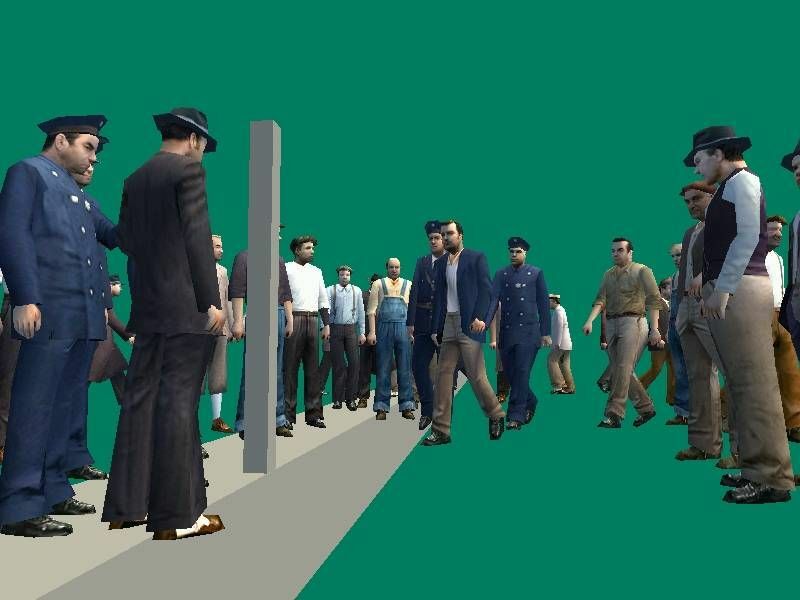 We also had an automatic animation generator which we used for pedestrians. Main characters, though, had hand controlled animations. The way animations would work: I listened voiceover files several times, then in real time animated the face via joystick while listening. Needless to say, it was very time-consuming. One thing I will admit, though, is that we didn’t really use two joysticks at once. This picture was for press and to make it more interesting, we put a second joystick in the shot. The fans that came along with us on this 15-plus year racket motivated us to keep going. For those of you who have been with us and played our games, the entire Mafia team wanted to take this opportunity to say thank you. More important, thank for you helping make Lost Heaven, Empire Bay and New Bordeaux what they are today. © 2016 TAKE-TWO INTERACTIVE SOFTWARE E SUAS SUBSIDIÁRIAS. DESENVOLVIDO POR HANGAR 13. 2K, HANGAR 13, 2K CZECH, TAKE-TWO INTERACTIVE SOFTWARE, E AS RESPECTIVAS LOGOMARCAS SÃO MARCAS COMERCIAIS E/OU MARCAS REGISTRADAS DA TAKE-TWO INTERACTIVE SOFTWARE. O LOGO DE FAMÍLIA "PS" É MARCA REGISTRADA E "PS4" É MARCA REGISTRADA DA SONY INTERACTIVE ENTERTAINMENT INC. O ÍCONE DE CLASSIFICAÇÃO INDICATIVA É MARCA REGISTRADA DA ENTERTAINMENT SOFTWARE ASSOCIATION. TODOS OS DIREITOS RESERVADOS.